The Rossburn School District was established in October 1881 and the first school in the region was built one mile north of the present town of Rossburn, in what is now the Municipality of Rossburn. Built from locally cut and hewn logs, the school also served as a church and community hall. The building was condemned by the school inspector in 1896 and a new building was constructed in town. 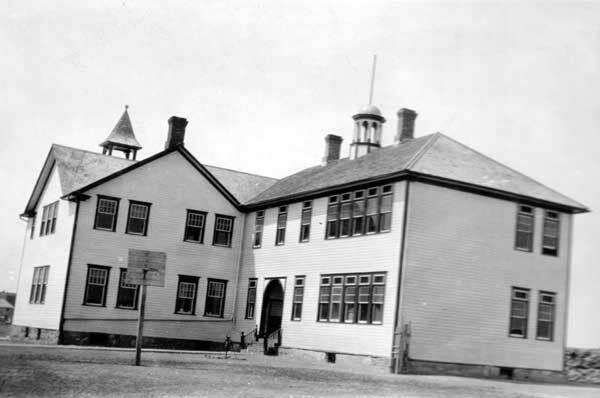 By 1908, this building was overcrowded so a two-storey wood frame schoolhouse containing four classroom was constructed. Eight years later, it was enlarged with four more classrooms. This building would serve the elementary educational needs of the community until 1959 when the present Rossburn Elementary School was built nearby. The old building was then demolished. The Rossburn Collegiate was constructed on its present site between 1965 and 1966. In 1958, the Rossburn School District became Rossburn Consolidated School No. 2358 when it was consolidated with Perth School No. 575 and Bruan School No. 888. It became part of the Pelly Trail School Division in 1968. The teachers in the first Rossburn School (1882-1896) included Mr. Bartram, Mr. Carpenter, Mr. Crawford, Mr. Cram, Mr. Reddington, Mr. Seller, Mr. Thompson, William Young, Thomas Young, Miss Home, Miss McLeod, Miss Ross, Miss Starrat, and Miss Thorn. Teachers in the second Rossburn School (1896-1908) were Miss Kate Horne, Henry McKeen, Miss Jennie Galloway, Miss Margaret McKinney, and Miss Minnie McKinney. Teachers between 1896 and 1908: H. H. McKeen. Teachers in the third Rossburn School (1908-1959) included Miss Darnley (1908-1912), Miss Daggett (1912), Mr. R. Mulligan (1915), M. MacKinnon (1914-1915), Jessie M. Nickel (1914-1915), Myrtle Dixon (1917-1918), Lottie Hodkinson (1917-1919), Isabelle Phizacklea (1917-1919), Pearl Strong (1918-1920), Violet S. Lawman (1919-1920), Annie B. Sinclair (1919-1920), Mr. Homfeld (1920-1922), Elsie B. Fisher (1920-1922), Ester Birch (1921-1922, 1923-1924), Haze A. Ogston (1921-1922), Eva Vickery (1922-1923), S. Crook (1922-1923), Alice Mellor (1922-1924), Sara E. Moffat (1922-1924), J. H. Irwin (1923-1925), M. Hutchinson (1924-1925), Helen Garvie (1924-1925), Isabelle K. Smith (1924-1925), M. McDougall (1930-1932), Margaret Bell (1930-1935), Mary Jean Coulter (1930-1934, 1936-1937), Violet Rowe (1930-1934), Vina Harlow (1932-1934, 1935-1938, 1940-1941), Z. W. Peden (1933-1934), Gerald Lepper (1933-1935), Alberta L. Griggs (1934-1937), A. B. Cunningham (1935-1936), Harris T. Huston (1935-1938), Gladys Radley (1936-1938), Margaret Dallas Kennedy (1936-1941), E. George Goodwin (1937-1938), B. E. Kent (1938-1939), Stephen Clare Sparling (1938-1939), W. J. D. Fulford (1938-1939), Marjorie M. Stevenson (1938-1941), John Parsons (1939-1941), A. R. Low (1939-1949), S. Hamilton (1940-1941), Adeline E. Smith (1941-1942), Kathleen Watson (1941-1943), Helen Forrest (1941-1944), Verna Hughes (1941-1944), Maude Shewfelt (1941-1942), R. Hines (1942-1943), Olive M. Andrews (1943-1944), Phyllis Chopp (1943-1944), A. J. Wilson (1943-1946), Bertha J. Davis (1943-1945), Grayce I. Lehmann (1944-1945), Eleanor Deane McMillan (1944-1945, 1949-1951), Lorna Veitch (1944-1954, 1955-1956, 1957-1959), Lois E. Cochrane (1945-1946), M. H. Rolph (1945-1946), Dorothy E. Woods (1945-1948, 1950-1951), Lois E. Blair (1945-1946), J. G. Anderson (1946-1947), E. Carlyle Mayes (1946-1947), M. I. Mazier (1946-1947), Ruth Yvonne Graham (1947-1950), J. M. Hemphill (1947-1948), H. F. Neable (1947-1948), O. A. Stechkewich (1947-1949), F. Clucas (1948-1951), Lloyd Sulymka (1948-1950), J. E. Murphy (1948-1952, 1954-1957), M. Rosecki (1949-1950), Harry M. Middlemass (1950-1956), Ed Lytle (1950-1951), Amy Zink (1950-1951), A. M. Mayes (1951-1952), Mary Murphy (1951-1954, 1955-1957), Maurice Chomica (1951-1956), John Kolosky (1952-1953), M. Elvers (1953-1954), C. C. Antoniw (1954-1956), Elsie E. Laycock (1954-1955), Patricia G. Finlay (1955-1956), Dianne MacDonald (1955-1956), J. Rogan (1955-1956), E. A. Gunn (1956-1959), M. J. Tokar (1956-1959), Margaret Hay (1956-1959), R. Stitt (1956-1957), L. R. Neil (1957-1958), F. K. Schultze (1957-1959), Cecil V. Gunn (1957-1959), Beverley Leitch (1958-1959), and Isabel Strand (1958-1959). GR8461, A0233, C131-1, page 43.